This is Landons new favorite past time. 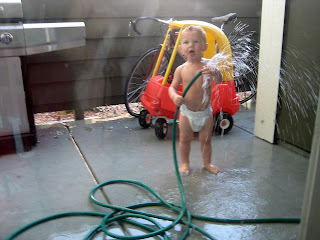 He loves playing with the hose on the porch. It is a great way to keep him busy while I am getting things done. But now that it is almost fall it won't last long. I am so excited for the change of seasons fall is my favorite time of year. And yes, he is naked! Almost! I love it! 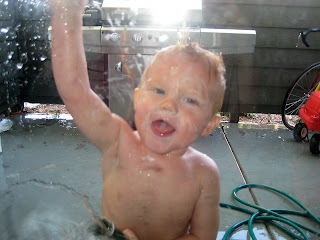 It's so fun to watch him play with the hose! He just loves it. Us mom's will let the kids do anything to entertain themselves so we can get stuff done. I have to comment on the picture of your guys down below, you look so good Lani. You said you have been hitting the gym with a trainer right? You seriously look great. great idea! now yer bathtub can stay cleaner longer...lolol just be careful he doesn't keep doing it like his dad use to do. it took Jim & Dee years to break him of it (i think not until he hit like 18 yrs old, suppin' like that). I just wanted to check in and see how things are going for you guys, hope all is well. Miss ya!